Imagine my delight when I read this article talking about intranets VS ESNs. 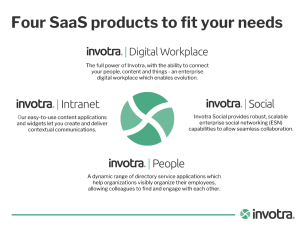 I may have been slightly tongue-in-cheek with my meme-based tweet (sorry not sorry) but our Invotra Digital Workplace incorporates a great (and genuinely easy to use) publishing area (Invotra Intranet), alongside a scaleable ESN platform (Invotra Social). We also have an awesome people finder and profile tool (Invotra People, which is the cornerstone of our products, which includes a team chart, location look-up ) alongside the potential to connect people, content, and things in the IoT world (more of that to come later). We’ve been using our own platform as our intranet too – the lovingly named 42 (you don’t have to be a Douglas Adams fan to work here, but it helps). While at around 35 people we’re, *much* smaller than our clients (we have over 200,000 users across key central Government departments like DWP, Home Office and DfT) we’ve been using our intranet to publish our processes, share updates on our projects and work together on new ideas. It’s been really refreshing to have that content capability alongside the ability to collaborate with colleagues! In the past I have worked on intranet platforms where that information is completely segregated (and coloured accordingly) to differentiate between social and published content, but I think in today’s world, where the lines are becoming increasingly blurred, having published and social content within the same umbrella makes sense. In my (anecdotal) experience, however you indicate information, however clearly it is signposted, often users don’t distinguish between entire platforms. And that’s before taking accessibility into consideration. The number of times I was contacted about our HRIS, or the H&S platform, as there were links on the homepage and it was assumed that content accessed from the homepage is all “part of the intranet”. I particularly like our blogging functionality. Not *just* because I like the sound of my own voice, but the full WYSIWYG functionality means I can include images in what I write. I also love the fact we have in-place editing, so I can change the layout of my marketing area on our intranet easily (and our intranet manager loves the fact he can update the homepage layout without needing to speak to our tech team, lovely as they are). 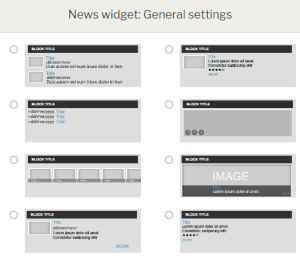 Our widgets are also really easy to use. You don’t need to know the difference between a part and an app (sorry SharePoint-lovers). We have a variety of layouts for each style – here’s just a snapshot of the many options (there are over twice as many) to show my news feed. It’s useful as I don’t always have great images of internal news, but when there are content types with awesome pictures, I can use them too! It’s great to be in a position where I genuinely believe in our product, which integrates the best of breed people, intranet and social functionality (which I’ve only touched on here!) – if you’re interested in finding out more, let us know if you’d like a demo! Of course, your organisation may have a different set of needs and wants. Technology is not a silver bullet (here’s a handy/dreadful visual I made earlier this week in response to a great article shared by Adrian Hancock), and there’s no one size fits all. 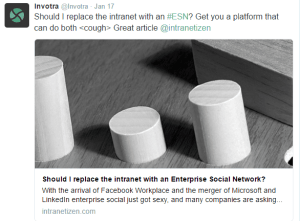 If your organisation isn’t ready to embrace social, Invotra’s product structure gives you the option to select Intranet *or* ESN (or both!) along with our People offering.